Another Friday ballet, rather than Saturday. I don’t know if I’ve explained before, but we subscribe to the Washington Ballet, and we’ve got a Kennedy Center ballet subscription as well. And when the Washington Ballet danced in the Eisenhower Theater at the Kennedy Center, all was well. 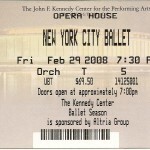 They would never schedule a Washington Ballet event in the Eisenhower Theater at the same time as another ballet program in the Opera House. But now they’re rehabbing refurbishing remodeling whatever the Ike Theater, so Washington Ballet is dancing elsewhere. And they’re having to coordinate with Shakespeare Theatre productions and whatnot, so they don’t care so much about the Kennedy Center ballet schedule. 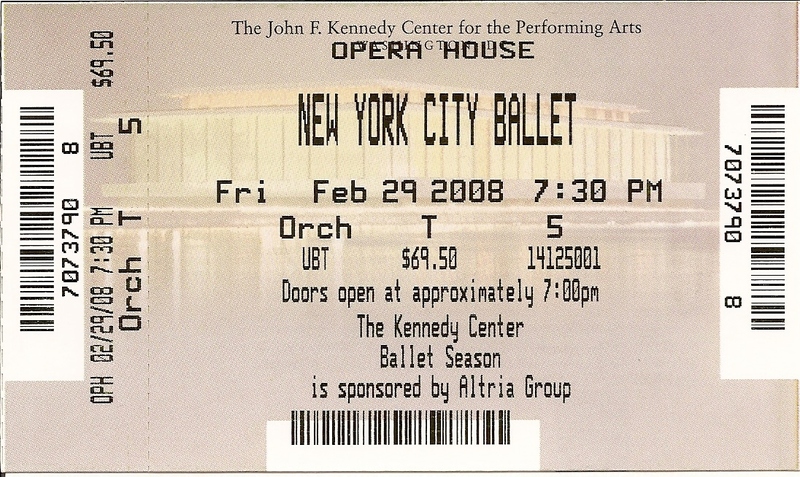 And so twice this year we’ve got tickets to two different ballets on the same Saturday night. So we opt to swap the Kennedy Center tickets for another night, since we have to coordinate with Becky regarding the Washington Ballet. So that’s why we’re here at the Kennedy Center on a Friday night. This particular dance, in any case, is just simply charming as all get out. As noted, the music is an orchestral arrangement of the two songs; it’s not just a simple reading of one after the other. And so the looping thereof back and forth, coming in and out, works quite well of course with the carousel image. The choreography is a bit obvious with the corps forming a big ring and going round. But when the guys lift up their partners, who in turn move the brass poles they’ve been handed up and down, and it all gets so explicitly carousel-like, well, I gotta grin in delight and just go with it. Next is Zakousky, with music by four dead Russian composers, choreography by Peter Martins, who’s sitting right over there. He’s the artistic director, so no surprise. The dance is just two dancers, Yvonne Bourree and Benjamin Millepied, pas-de-deux-ing and whatnot, all pretty uninspiring. There are a lot of lifts that are kinda half-hearted halfway up lifts, like he’s trying to get her up high but never makes it. They stay with the timing, however, so there’s not like any time where he could have gotten her up there. So it’s all by design. But why? Why these tepid unsatisfying lifts? Towards the end he shoots her way the hell up there, so clearly he’s able to do it. So it remains a mystery as to why there were those weird lifts. The music runs the whole range, from pure delight from our man Tchaikovsky, and even Prokofiev, to the demonic irritations of Rachmaninoff, and on to Stravinsky sounding like he’s trying to kill us. There’s one terrifying moment where Yvonne Bourree is doing some solo combination, moving upstage left, and she falls. Just completely wipes out. You know how disappointing it is in figure skating when they fall? It’s a surprise and you’re saddened by it, but you do see it all the time. You don’t see it in ballet, certainly not in the pros anyway. And it’s a ghastly shock. She just gets up, though, and jumps right back in, somehow able to get back in step with the music. I have enough trouble staying on the beats when everything goes perfectly well. But after a fall? Yikes. So I therefore hold her in so much greater esteem, for falling. Weird, huh? After the first intermission we come back to Agon, music by Stravinsky again, choreography by Balanchine himself. I expect to enjoy this one the most – hey, it’s Balanchine right? – but again with the Stravinsky madness. At least it’s got the legendary Wendy Whelan, another one of those dancers whom I imagine to be like 9 feet tall. Only she’s really so much smaller in person. Not frail exactly, but … delicate. But muscle-y too. And lovely. Last up, after another intermission and where we see our very own ballet mistress Miss Jessica out in the lobby, is The Concert (or the Perils of Everybody), music by Chopin, choreography by Jerome Robbins. It’s a totally comedic farce, something you don’t see a lot in ballet. There’s a lot of business involving the dancers as audience to a piano recital, silliness with chairs and such. The best joke here is when Stirling Hyltin plays this utterly enthusiastic concert-goer, sidling her chair right up to and fairly hugging the piano. And when the musical chairs begins with patrons being in the wrong seat, at one point someone literally pulls the chair out from under her, but she doesn’t even notice, still just sits there clinging to the piano. Unfortunately there’s also a weird violence-against-women-as-comedy vibe going on too. The other two sort of main characters are a man and woman, I assume a married couple, the husband of which couple chases after Stirling Hyltin a lot. After failing to catch her, he pulls out some bat or stick or something and bashes her over the head with it, able then to drag her offstage. This is apparently supposed to be funny. Later he sneaks up behind his wife, brandishing a knife. He stabs her repeatedly, but alas to no effect. He then tests the knife on himself, of course doing himself grave harm. But, again, beating and stabbing women – funny or not funny? The wife part of the couple we at first take to be Likolani Brown, next to whose parents we used to sit before they moved their seats over to the other side of the opera house. They’re trying to be make their way closer to the middle. We haven’t seen them in a while, nor do we see them tonight since they’re Saturday night folks. Like we usually are. But this probably can’t be Likolani Brown, since it’s somewhat of a featured role in this piece, and she’s listed in the corps. The one truly hysterical section of this act comes when six ballerinas dance a more traditional piece, as if part of an actual corps de ballet or something. It’s totally real and funny when one of them is always off or behind or doing the reverse of what she’s supposed to be doing. Having myself been in a ballet recital or two where I have only a dim idea of what I’m supposed to be doing, and I end up just looking at Dawn or someone else for cues as to what the next likely movement is going to be, I can certainly relate. I am howling and crying with laughter. I mentioned a letter that I had written to Monsignor, requesting a ticket to the Mass that the Holy Father will give at the baseball stadium in April. Saw this morning a small piece of the puzzle. WASHINGTON (AP) — The Archdiocese of Washington is giving 14,000 tickets to about 120 Catholic dioceses for the April Mass that will be celebrated by Pope Benedict XVI at the Nationals ballpark. Archdiocese spokeswoman Susan Gibbs says the biggest share will go to the Diocese of Arlington, which will receive 6,000 tickets. The Archdiocese of Baltimore will receive 2,500. Gibbs says the Archdiocese of Washington will announce Friday the ticket allocation to parishes that are part of the archdiocese. Each parish will receive tickets based on the size of its Mass attendance and whether it has a school or significant religious education program. So, I was figuring that the stadium held about 45,000 people, but I wasn’t sure how many of those would be alloted to the various parishes. I thought if Monsignor got 100 tickets, then I was out of luck. If he got 1,000, maybe I had a chance. If he got 10,000, then I was in for sure. But I had no clue at all as to how many tickets he would have to work with when considering requests. This new info makes me think he’s got closer to 100 than 1,000. I mean, if the whole Archdiocese only has 14,000 to work with, and then over half of those are going to Arlington and Baltimore alone, then I can’t see St. Matt’s getting 1,000 of the remaining. Not with like 143 parishes in the Archdiocese of Washington. That averages out to only 38 tickets per parish. But the Cathedral likely gets more than average, being bigger than average? Maybe. Dunno. And what about the remaining 30,000 or so, the share of the stadium that the Archdiocese doesn’t have to give out? I was figuring that the schools in the Archdiocese would get a big share as well. And looking at the Archdiocese’s website, apparently they’ve got 106 schools and nearly 31,000 students. Sounds about right. A quick check, though, at the stadium’s website tells me that it seats 41,222, not quite the 45,000 figure I was working with. But were just tossing around rough numbers here. Heck, maybe they’ll get another couple thousand on the field anyway. I only get 14 out of 24 and thus lose the office pool, after winning two years in a row. I can usually count on getting three out of the four acting awards, but manage only two this year. Even worse, I screw the pooch completely on foreign language and documentary and shorts. Big fat zero on all five. Mike Kelly wins with 15. Damn, I was counting on that forty bucks. I’m otherwise thrilled, however, that Marion Cotillard and Tilda Swinton both win, since I utterly adore them both, Ms. Swinton for Orlando & Mlle. Cotillard for Un long dimanche de fiançailles and Jeux d’enfants. I probably shouldn’t have gone with the grand dame legends in both actress categories. But, to be perfectly honest, going with that thinking would probably have led me to pick Cate Blanchett for supporting, given that she was up for leading as well. Or I would have gone with Saorise Ronan on the theory that the youngest or oldest wins the supporting actress category, and if I wasn’t going to go with Ruby Dee as oldest then I’d go with Ms. Ronan as youngest. Ms. Swinton would have been just about my last pick, despite being easily my favorite among the group. And I wish I had gone with Taxi to the Dark Side instead of No End in Sight, after hearing Bill Moyers’s piece on it from his Journal show. I listened to it by way of podcast, while I was picking up trash off the street on Sunday. I hadn’t realized Taxi was made by Alex Gibney, director of the excellent Enron: The Smartest Guys in the Room. But, then again, Gibney was also executive producer of No End in Sight, so who knows what I would have done with this information if I’d had it on Friday, when I filled out my office ballot. And all of this is very much despite the fact that La Vie en Rose and Eastern Promises were the only movies among all of the nominees that I actually saw, of course. I try not to let complete ignorance get in the way of these things. Dawn rides her bike to Mass, but I’m running late so I leave fifteen minutes later and drive. I park on 17th a block before St. Matt’s, right in front of the Human Rights Campaign. After crossing over to Rhode Island, I notice that Dawn’s bike isn’t locked up in the bike racks on the side of the YMCA. Has she not arrived yet? She should be here by now surely. I wait for a minute, checking my phone to see if maybe she’s called me, maybe had a flat or something. Then I decide to walk the block down to the Cathedral, see if maybe she’s locked her bike to a pole or parking meter. Sure enough, there’s her bike about halfway down the block. I see Monsignor at the back of the nave and say hi & give him a hug. I sent him an email Thursday night last, formally requesting a ticket to the Papal Mass in April. I wonder if he’s read it yet. He must have gotten a ton of requests. I certainly don’t ask him, though. Just keep my wondering to myself. The choir sings Justitiae Domini rectae during the Preparation and Ad te levavi oculos during Communion, both arrangements by Palestrina. I always have fun trying to decode the Latin on my own. If figure the former is The Lord builds justice and the latter is To you I lift my eyes. Eh. I’ve done only okay. The first is from Psalm 19, verse 8, (ChoralWiki has a typo, saying it’s Psalm 18, verse 9), and the NAB translates it as The precepts of the Lord are right. I went with the wrong -rect, apparently, thinking rectae to be some form of erect, but it turns out to be like correct. And I went a little too literal with justitiae, although the King James has it as statutes rather than precepts, but I suppose the Catholics maybe work more from St. Jerome’s Vulgate, which has the Latin as praecepta Domini recta. But now wait a minute. That’s from the Vulgate’s Psalm 18, verse 9, so maybe ChoralWiki is correct in the first place. Only now I’m thoroughly confused. Some more research for another time is definitely called for here. I’ve nailed the second one, though, Ad te levavi oculos, quite exactly. It’s from Psalm 123, first verse, To you I raise my eyes in the NAB, and I’m not going anywhere near King James or St. Jerome this time. We’ve got readings all about thirst today. From Exodus we get Moses striking the rock at Horeb at the Lord’s command and getting water. And from the Gospel of St. John we get the story of the Samaritan woman and Jacob’s well. It’s a really long passage but Deacon Work reads the short version, the version in brackets. Don’t usually do that at St. Matt’s. Usually always get the long version. We get from St. John his usual specificity: he tells us this incident happens about noon. But what strikes me most is that Jesus unequivocally tells the Samaritan woman that he is the Messiah. This isn’t like Jesus asking the disciples if they think he’s the Christ, and then directing them to keep mum when they say they think so. Here he’s saying it right out. Of course, the disciples aren’t there. They’re off buying lunch. And this woman isn’t even a Jew, rather she’s one of them there pagan Samaritans. So why is he telling her? Heck, she even asks him why he’s getting water from her in the first place, given that, as St. John helpfully tells us, For Jews use nothing in common with Samaritans. We have to really like her though, for almost teasing Jesus when he starts in with the living water metaphor. Sir, you do not even have a bucket and the cistern is deep; where then can you get this living water? Heh. He doesn’t even have a bucket. It’s interesting that Jesus then tells her that anyone who drinks the living water will never thirst again. But of the plain old well water, Everyone who drinks this water will be thirsty again. The Exodus story of Moses and the rock apparently contrasts a later incident in Numbers, chapter 20, forty years after the first, where the people are yet again thirsty and getting angry at Moses. They’re thirsty again, see? In the latter occurrence, though, the Lord directs Moses to order the rock to give up its waters, not hit it. But Moses instead just hits the rock again. He succeeds in getting the water flowing, all right, but for his disobedience the Lord will never allow Moses to ever make it back to Israel. The most striking thing in this gallery of amazing Rodin’s isn’t a Rodin at all; it’s an enormous painting of St. Joan of Arc by Jules Bastien-Lepage. It’s the kind of thing that totally stops you dead in your tracks. I’m standing there dumbfounded for a minute, then I realize that this is yet another object that Helena had suggested seeing. So totally major points for her for this, and for the caryatid tips as well. I spend almost forty minutes with St. Joan, sitting directly across from her. Like I said, it’s a gigantic work. No size is listed on the identification plaque, but I’ll estimate eight feet by eight feet square. (In fact it’s 8’4″ by 9’2″.) St. Joan is to the right, looking off-screen further to the right, and up. She’s evidently been spinning and has been interrupted. Her stool at the wheel behind her is lying knocked over. Behind her in the garden, between her spinning and the house, are the three saints, hovering in the air. St. Joan is so real, standing there. She’s painted in an almost hyper-real style compared to the saints. They almost blend into the house behind them, St. Michael’s head right at the apex of the gable and his armor nearly the same color as the bricks. St. Margaret is to his right, somewhat below him, the angle from his head to hers exactly matching the pitch of the roof. St. Catherine is very hard to make out at all, behind the spinning wheel and some trees, and it’s hard to make out her face at all. Perhaps her face is buried in her hands. It’s hard to say. She could be a martyr holding her own decapitated head, for all I can tell. Maybe depends on which St. Catherine she is. The right side of the house almost divides the picture exactly in half, separating the saints from St. Joan. And she’s only hearing them, not seeing them, as they are behind her and she’s gazing so intently up and away from them. She so obviously moved, overwhelmed even. She’s grabbing a branch in front of her, maybe even leaning on the tree behind her for support. She dressed very plainly, simple cotton and wool, skirt and blouse and what-do-you-call-it over the blouse, like a cardigan that laces instead of buttons, or an unboned bodice with sleeves. The picture is an interesting companion for today for the Botticelli, although St. Joan is so much bigger than St. Jerome, which I suppose one can be if you’re oil on canvas versus tempera on wood. Both saints are depicted at important milestones in their lives, although St. Joan is at a beginning and St. Jerome is at an end. Not entirely the end for him, mind you, since he’s got the glorious afterlife awaiting him. And despite this moving beginning moment, St. Joan’s battles against England aren’t going to end well, at least not for her personally. I find the gallery with Rodin sculptures. Helena had suggested checking out the fallen caryatid. I’m eager to do so, especially because I’m not sure what a caryatid is exactly. Caryatid makes me think of katydid. I’m guessing though that it’s not really some kind of insect, but what would it mean to be a fallen katydid? What precisely would one have to do wrong to be a fallen katydid? The god beeing burned in this sort, and perceiving that promise and faith was broken, hee fled away without utterance of any word, from the eyes and hands of his most unhappy wife. But Psyche fortuned to catch him as hee was rising by the right thigh, and held him fast as hee flew above in the aire, until such time as constrained by wearinesse shee let goe and fell downe upon the ground. That’s not quite how it’s unfolding here. It’s a marble sculpture, maybe 1/3 scale, or maybe Greeks and/or gods were smaller back then. They’re on a rough base, just like a rock really, except there’s also this prong coming up out to the right, on which Cupid casually kind of rests his left hand & wrist. Seems like maybe it’s a necessary structural element for the sculpture. One can see how otherwise his whole arm might snap off in a stiff wind. The immediate effect is that he’s fleeing and she’s clinging tightly, trying to keep him from getting away. At least that’s the impression given by their relative positions to one another. But they’re not at all tensed up and fighting. Rather, they’re fairly relaxed. As mentioned, his left hand is rather casual on the prong. He’s also hiding his face under his right arm. Her face is hidden too, buried into him, under him, right up to his face. Her left arm is thrown around his torso, but her hand around his back is rather limp. And her right arm is bent double, the back of her hand resting protectively between her breasts. She’s both pulling herself toward him and defending herself from him. And it’s his face that’s tormented. Hers is fairly serene. She seems like she’s trying to kiss him ever so delicately. The plaque says that the sculpture is particularly “illustrating the moment of Psyche’s abandonment by Cupid owing to the machinations of Venus.” I’m not sure what moment that would be. Psyche’s whole reason for being there in the first place I suppose stems from Venus’ machinations. But this moment, when he’s fleeing? Wouldn’t that be the sisters’ machinations? Down at the west end of the gallery I find the fallen caryatid. Two actually, bronze casts. One carrying a stone, the other an urn. Turns out a caryatid is “a sculpted female figure serving as an architectural support taking the place of a column or a pillar supporting an entablature on her head.” Not an insect at all! I’m in no way disappointed. They’re not anymore serving as architectural supports, Rodin having extracted them from The Gates of Hell. But once a caryatid, always a caryatid, I suppose. The one under the stone seems a whole lot more burdened than the one with the urn. Much more tormented. And her big toe is rubbed bright, as if people sense her greater anguish and feel a need to touch her, to comfort her. Very confusingly, the plaques for both caryatids say that they were first modeled about 1881 but that these bronze casts are from 1981. Nineteen eighty-one? A hundred years later, long after Rodin’s death? Are they still Rodins? I’m on my own Tuesday morning in NYC, while Dawn is in training. So I’m off to the Metropolitan Museum of Art. 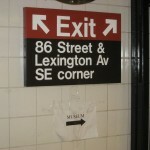 I ride the subway from Grand Central to 86th Street, on the 4 Express. Stops only at 59th Street in between. I ride on car 1185, part of the R142 order built by Bombardier for the IRT from 2002 to 2003, replacing the old Redbird fleet from 1958. 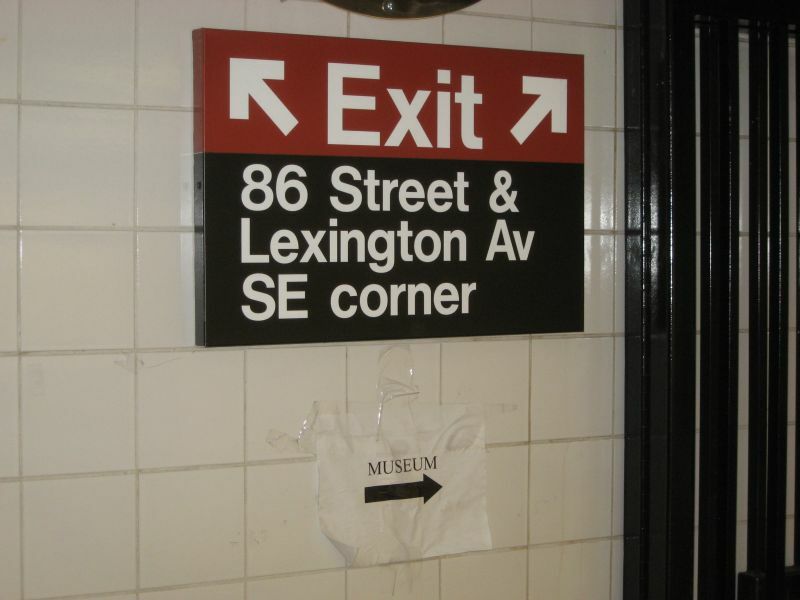 There are exits at the 86th Street station out to both the east and west sides of Lexington, but there’s a helpful sheet of paper taped to the wall telling me which way to go. I get to the museum around ten and have to check my backpack. I wait around until ten-fifteen for the free introductory tour. Takes about an hour, making our way from ancient Greece to Rome to 18th century Africa to America 1928 (Demuth’s Figure 5 in Gold) back to 18th century France to 14th century Germany to 16th century Spain back to 18th century France again and finally to Vermeer’s Young Woman with a Water Pitcher from 1661 or so. That’s quite an hour, don’t you think? “Julian or Damian?” I ask. She admits that it’s Damian, although this clearly hasn’t endeared me any more to her either. On my own for a couple of hours I go looking for some objects that Helena has suggested. On my way out from the Vermeer I notice the one Botticelli that they’ve got here, so I stop at that for a while. It’s The Last Communion of St. Jerome. The scene depicted takes place in St. Jerome’s bedroom cell where he spent the last decades of his life. If the info plaque didn’t tell me this, I’d have figured that this was in a church. What looks to be like an altar, with palms and crucifix above, is in fact St. Jerome’s bed. I suppose maybe I shouldn’t have mistaken the bedspread for the altar cloth, in that the former here seems to be some sort of fur or animal skin whereas the latter is generally just plain white. The cell itself is a strangely abstracted place, in that from our vantage point it looks like a three-sided building somewhere outside. The sky seen above the roof and through the windows is solid blue, cloudless, and we see no other landscape features. It’s almost like the whole room is suspended in mid-air. Maybe that helps to enforce the idea of this being the last communion of St. Jerome, like he’s almost already on his way. He’s already no longer of this earth, maybe not quite in heaven yet but clearly on his way there. There are six figures in the room, St. Jerome included. There are three on each side, facing each other, at the foot of the bed. St. Jerome himself is middle right, facing the priest at middle left, who is holding the communion wafer in his right hand, just about ready to place it on St. Jerome’s tongue. Each man is being assisted, St. Jerome being physically supported by two monks, the priest attended by two altar boys. Generally the figures are all facing each other, with their bodies turned slightly towards us, so not quite facing but not quite profile. Three-quarters turned maybe. Or perhaps the ballet croisé. St. Jerome’s face is in direct profile, as is the face of the altar boy directly across from him. The priest’s face is almost, just almost, in profile, except for a slight tilt of his head, where we can see the underside of his chin. The tilt really conveys a lot of sympathy towards the saint. The monk whose head the priest’s head almost touches also looks very concerned about St. Jerome. The other monk on the other side of St. Jerome looks less so, but he is the one clutching him tightly, holding him up. The altar boy further away seems to gaze up at his candle, distracted, lost in some other thoughts. The nearer altar boy, the one in profile, seems very interested. He’s almost up on his toes, gazing over the priest’s shoulder, trying to see what’s going on. He seems much more curious than concerned. St. Jerome himself appears to be focussed on nothing. He is on his knees, hands clasped in front of him in prayer, mouth open to receive communion. But as he looks straight ahead, he doesn’t seem to be seeing the priest or the altar boys. Perhaps he’s looking inward. Again, like the scene itself, he’s no longer really here among us. He’s on his way already. The frame itself is a work of art too. It’s heavily gilded, but the gilding is fading, so that it now looks like orange marmalade. And above the painting the frame is arched, and there’s a separate scene painted in there as well. God on his throne, surrounded by angels and cherubim. These are true cherubim in the sense that they’re little children heads with wings, no fat little bodies attached. They’re frankly disturbing, is what they are. The angels are lovely though. What’s most interesting is the crucified Christ that God holds, between his knees like a cello. The Last Communion of St. Jerome, early 1490s, Botticelli (Alessandro di Mariano Filipepi) (Italian, Florentine, 1444/45–1510), Tempera and gold on wood; 13 1/2 x 10 in. (34.3 x 25.4 cm), Bequest of Benjamin Altman, 1913 (14.40.642). We take the noon Acela to NYC. I’m incredibly severely monumentally cranky about walking the 1/2 hour from home to Union Station and again on the other end with another 1/2 hour from Penn Station to our hotel, which is on East 50th between Lexington and Third. Maybe if I’d brought the rolling suitcase, I’d be happier. But I’ve got just an overnight bag slung over my shoulder. And in it also is Dawn’s big three-ring binder for her training. And our coats, since it’s so warm out. I feel a little better after checking into the San Carlos and then heading straight to a pub on Second Avenue called the Press Box. I have a Sam while Dawn has a glass of Pinot Grigio. We walk around a bit, on 50th towards the river, although we don’t cross FDR Drive. We find Beekman Place then make our way back to First Avenue, then back east on 52nd. We look down towards the UN and over towards Roosevelt Island. We kinda sorta make our way towards Central Park, going back to First and up to 59th, then west towards the park, although it’s getting late and will be getting dark soon. Yes, it’s getting darker and darker, we’ll never make it there and back, so we head back down to 51st between Second and Third to Amma. We share a yummy bottle of the Rocca Bernarda Pinot Grigio. 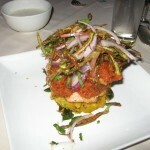 Dawn goes with the Dum Aloo, whereas I opt for the Malabar Salmon. It’s all really, really good. 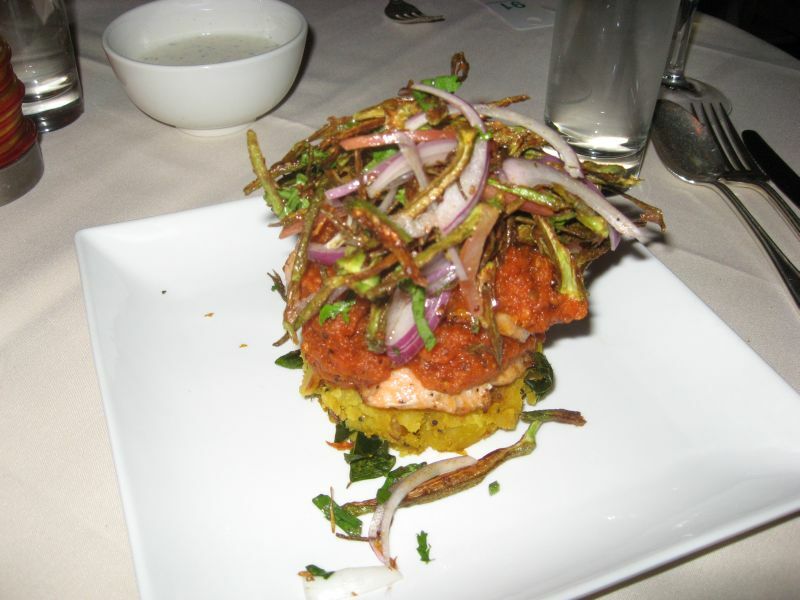 The salmon is presented quite nicely, too. We go with the Gulab Jamun for dessert, and it’s quite tasty but there’s some problem with the coffee so we’re done with dessert before I get my coffee. 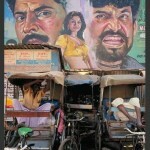 There’s a cool picture on the wall next to our table, a photograph from India of bicycle taxis parked in front of a billboard advertising a Bollywood movie. I don’t really recognize anyone in the movie poster, but if you held a gun to my head I would maybe say that the guy on the right is Amitabh Bachchan. I ask our waiter and he doesn’t know. 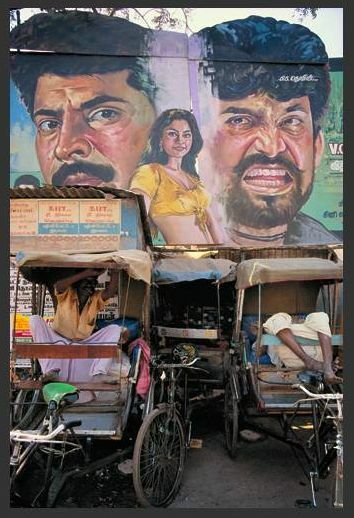 Another waiter says that the picture is from southern India and the guy on the left is Mammootty. Oh, hey, I’ve seen him in Rajiv Menon’s movie Kandukondain Kandukondain, a Tamil version of Sense & Sensibility. Mammootty plays the Col. Brandon character to Ashwarya Rai’s Marianne Dashwood character. We all pause to sigh over Ashwarya Rai. We’re back to the Kennedy Center to see the Tokyo Ballet perform Raymonda. It’s another Mariinsky, as in Kirov, original. Petipa choreography of course. Dawn notes that it’s a pretty minor company doing a pretty minor work. And it’s totally great. Like La Bayadére it’s pretty much about a pretty girl in love with a handsome boy, and there’s some evil guy trying to get the girl instead. Instead of ancient India and a temple dancer, in this case the setting is medieval Provence and the pretty girl is Raymonda, the niece of the Countess of Doris. The handsome boy this time is Jean de Brienne, who is currently off on a Crusade, but like Solor he is represented by a portrait. And the villain is very specifically Muslim this time, leader of the Saracens, Abderachman, rather than the High Brahmin. Oh, and the King of Hungary is here, pretty much in charge of everything. Like the Rajah, I suppose. It’s all very Bayadere-like, but alas no Kingdom of the Shades, although Act III is traditionally known as Le Festival des Noces. I’m very sleepy during Act I, then perked up by Act II, and then completely blown away by Act III. I cannot fully believe it when Terashima Hiromi and Denys Matviyenko keep reappearing, after what I can only think is the exhausting finale, to dance again. I’m happy to join the standing ovation, richly deserved for once. Although I wish more people would yell brava along with, or instead of, bravo, especially since I’m too timid to yell. The tulips, of which Dawn took a picture and sent to me with her phone. Dawn’s quite the frugal gal. She forbids me to send flowers to her actually on Valentine’s Day. 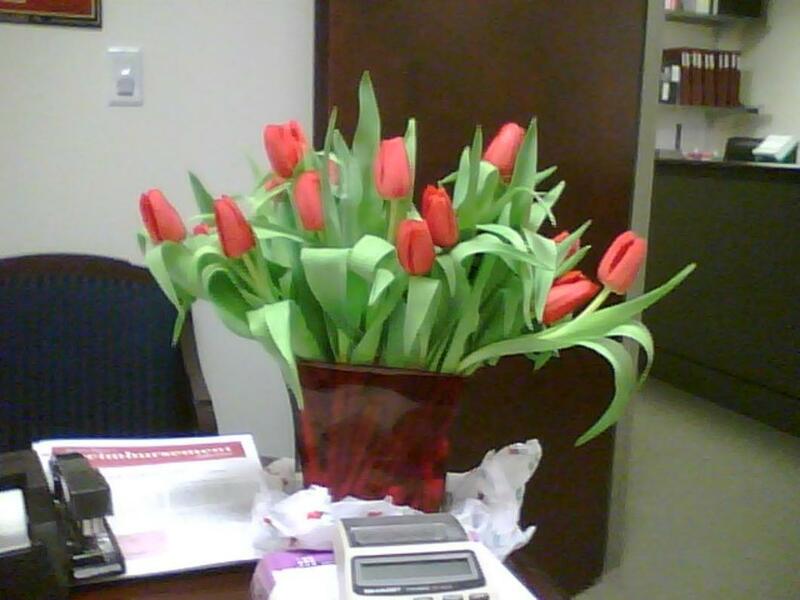 So I send her the tulips the day before. It’s apparently not any cheaper the day before though. And the red tulips don’t seem to want to live very long. We immediately start planning for next year, for maybe yellow roses the week before. We don’t have processional hymns during Lent, rather just a psalm. Lord, hear my voice, we sing. Lord, hear my voice. The choir sings verses and a few members ring bells. And it’s always a shock to me during Lent when we skip the Gloria. During the Preparation the choir sings the Palestrina Scapulis suis, and then during Communion they sing a version by Orlando di Lasso. The first reading is from way early Genesis. The Fall. I notice how the serpent mixes both truth and lies to trick the woman. God knows well, he says, that the moment you eat of it your eyes will be opened and you will be like gods who know what is good and what is evil. This is true, of course. But just before that he says, You certainly will not die! And that’s most certainly a lie. And that’s what Lent is all about then, for us, really reflecting on our sins, making our way, preparing ourselves, looking toward Easter. The Gospel reading for the first week of Lent is always the same story, from the different Gospels, this year St. Matthew, of Christ tempted in the desert. Like Eve was. Like Adam was. Or even more so. I wonder here, though, if the devil is again mixing truth with lies, or just flat out lying. Could he really have given Christ all the kingdoms of the world? Were they his to give, if Christ would have worshiped him? I guess it’s temptation either way, whether the payoff is real or not. Maybe that’s a lesson in itself, somehow. Not so much what profiteth a man to gain the world. More like losing your soul for nothing. Nothing at all. Scapulis suis comes from Psalm 91, line 4 and half of 5. Pinions are the outermost feathers on a bird’s wing. He will shelter you with pinions, spread wings that you may take refuge; God’s faithfulness is a protecting shield. It’s funny, all the British TV we watch. Tonight we start watching a recent adaptation of Mansfield Park, being shown on PBS Masterpiece during their Jane Austin marathon. (The things we do for our loved ones, I tell you.) What’s funny is recognizing actors from other British TV stuff. This time it’s Douglas Hodge. As soon as I see him I say, “Hey, it’s Tertius.” Yes, he played Tertius in the version of Middlemarch that we saw, the one with the lovely Juliet Aubrey. We also saw him in The Way We Live Now, playing Roger Carbury, cousin to the odious Sir Felix Carbury, faithless suitor to Marie Melmotte, played by the dazzling Shirley Henderson. In Mansfield Park he’s Sir Thomas Bertram, Douglas Hodge is. It takes me longer to figure out the guy playing older brother Tom Bertram, heir to Mansfield Park. Finally. “Hey, he was Tom Pullings in Master and Commander.” I remember the cool scar he had on his cheek in that. Must have been the lack of that what made me take so long to recognize him. In general, everyone is way too good-looking, in a Georgian England’s Next Top Model kind of way. Except for Billie Piper’s eyebrows. What’s the deal with those? Whoever’s playing Maria Bertram looks vaguely familiar. IMBD tells me she’s the new Bionic Woman on NBC. And, whoa, she was in four-hundred and thirty-two episodes of Eastenders. Alistair Cooke being long gone, we have Gillian Anderson as our host. She reminds me of my all-time favorite stripper, Christina L. I suppose it’s not just that she looks like her, with her hair longer now, the same dyed red color. But also that I had made a deal with Christina that I’d try watching X Files if she would go out one night and look at the Comet Hale-Bopp that was big in the sky at the time. I watched like four episodes of X Files. Not really my thing, although I do really like David Duchovny in general. And Gillian Anderson, although at the time she didn’t remind me of Christina. And she never did check out Hale-Bopp, as far as I remember. Not really her thing, I guess. I help usher at the 5:30 at St. Matt’s. Funny that they start about two minutes early, but I suppose people are going to be streaming in late anyway. Place is jam packed SRO by about 5:40. But Monsignor reminds us in the homily that Lent is a season, a journey. It’s not just about today, but about the next forty (or so) days. We see the Washington Ballet doing a program called Genius. Eh. It’s all fairly modern and leaves me generally if not quite cold then let’s say tepid. What I do appreciate about the first two acts, Drink to Me Only With Thine Eyes, music by Virgil Thomson (Etudes for piano), choreography by Mark Morris, and There Where She Loved, music by Frederic Chopin and Kurt Weill, is that they’ve got live music, pianist Glenn Sales over there on the left. The second also includes soprano Kate Vetter Cain and mezzo soprano Shelley Waite. Note that the Chopin and Weill songs alternate; they apparently never collaborated on anything. I especially try not to much like the third act, Nine Sinatra Songs, choreography by Twyla Tharp. But, despite even having seen it before, it’s still pretty irresistible. My absolute favorite piece is One For My Baby (And One More for the Road). I’m not a huge Sinatra fan to begin with, and I’m even less of a Bette Midler fan, but I always remember her singing this to Johnny Carson on his last or next to last night, and then she ran offstage crying. But then also not only is it Erin Mahoney-Du dancing in it, but it’s her first appearance back since her maternity leave. She’s so great to see again. And especially in this, where she and Luis Torres play sort of drunk but not too drunk. And there’s this one move, where she sets and then leaps backwards for him to catch her, that just thrills me for some reason. I wait for it and thrill to it again in the last piece, My Way for the second time, where the entire cast returns to perform their variations all together. It’s right at the end, and she leaps back to him and then he dashes off stage left with her. We see American Ballet Theatre’s Sleeping Beauty. All I can say is that the Kirov really spoils one. Dawn declares that watching the corp tonight is like watching one of our recitals. Hyperbole, of course. They can’t be that bad. But at times I’m not sure if the corp are supposed to be moving in unison or in canon. They are that bad.